Discussion in 'MacBook Pro' started by gpsouza, Nov 21, 2014. Does anyone have problem running Parallels? I have a Late 2013 Macbook Pro 15" Retina, 8gb RAM, i7 blablabla... Parallels 10 (Original) and when using it to ONLY run Word 2013 it's barely usable. I had 3 doc opened, a few PDF's on my Mac and some tabs on safari and it was painful. Extremely lag on both ends (Mac and Windows), Mission control animation was inexistent and switching windows was too painful. I know that my Mac may not be the very best out there, but is enough to run these simple tasks. Word on parallels is laggy, even if it's the only goddam thing open on my Mac. What should I do? hmm, what does activity monitor look like? are you swapping memory? how much memory is allocated to the vm? i'm running parallels 10/windows 7 on both a macbook air and a macbook pro. both machines have 4 gigs ram allocated to the vm's and both vm's are very smooth. no problems here and my Windows Vm does a fair bit of heavy work. I've assigned a couple of cores and 2048MB of RAM to it. No need for more RAM, benches didn't show any improvements. How much free space do you have left on your Mac, and in your Windows VM? I note from your signature that you have a 120GB SSD. How much free space do you have after creating the VM? Late 2013 MBP with essentially the same usage (Win 8.1, Word) on Parallels 9 -- zips right along. One difference: 16GB RAM. Okay. And how much free space do you have in your Windows VM? I'm running Windows 7 in Parallels 9 on my 2011 MacBook Air, which only has 4GB of RAM, and it runs fine. I don't know how much more resources Windows 8.1 uses. But looking at how you configured the VM, I think allocating 2GB for it is fine. Have you tried bumping it up to 4GB to see if that makes a difference? So space isn't an issue. Have you checked the SSD by running Disk Utility? Go to the First Aid tab and do a Repair Disk. Before it had 4gb and it was even worse on Mac side... Disk Utility said my disk is fine. Did you see the video I posted here? It's just me or that is really slow? From the video, it didn't seem slow to me. 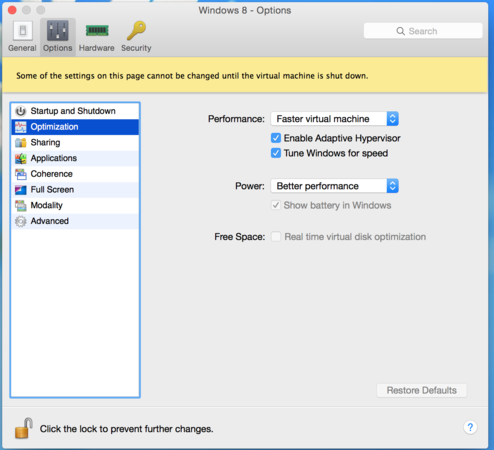 How can I improve virtual machine performance on my Mac? Other than that, I don't know what else to tell you. Sorry. Naturally. You bet. The other thing you may want to try is tuning PD's VM options for speed if they aren't already. looking at your video at 1:04 you look to be using all your RAM and falling into SWAP which will hurt performance. Try a clean boot and only running the VM with 1GB assigned and see if that helps. Assigning windows less RAM doesn't seem to hurt performance at 1GB and above IME. And for the record, since your one doesn't have a dGPU, I'm not surprised it's lagging a fair bit. I have a 15" with 2GB GT 750M and it never lags with VMware Fusion (with virtualization tools installed, of course). I think the suggestion to reboot and restart the vm without excess OS X programs running would be the best bet. I've been sampling my VM on a macbook air with the VM on an external drive, and it does't not lag at all. In fact its running smoother than the same VM on my loaded rMBP for whatever reason. Both MacBooks are running Yosemite, and Parallels 10. Unfortunately, running a VM is a pretty intensive process. I'd bump it up to 3gb of ram and 6-8 cores and see if that helps. Also make sure parallels' tools are installed in windows and you don't have any extra processes running in windows that are eating up resources. I did it already, but is kinda worthless running only windows. Preview is much better than windows pdf reader, but even preview is lagging without parallels running. But maybe if I do that it will have a negative impact on Mac side. Adding more RAM to the VM won't help as he's already running into host memory issues indicated by the compression being applied. The poor perf is indicative of thrashing of host resources IMHO and not performance starvation within the VM. Advice to the OP is try both ways and let us know what fixes it! Good luck! One thing it could be is Windows.